Metrojet crash in Sinai that was claimed by ISIS was due to 'mechanical impact' on plane, experts reveal. Top officials at the Russian airline Metrojet, whose plane crashed in Sinai on Saturday killing all 224 passengers, revealed Monday that the crash was not due to a technical fault but rather an external source. Alexander Smirnov, deputy general director of Metrojet, said the cause of the Airbus A320-200 crash "could only have been a mechanical impact on the plane" while it was in the air. That assessment was confirmed by Metrojet director general Alexander Snagovsky, who said "the only reasonable explanation is that it was (due to) external activity." The Islamic State (ISIS) affiliated Sinai Province claimed responsibility for the crash on Saturday, saying it had downed the plane. Egyptian aviation authorities argued the plane disappeared off the radar at 9,450m (31,000ft) - well beyond the range of shoulder-launched surface-to-air MANPAD missiles ISIS in Sinai is known to posses. However, the possibility that ISIS planted a bomb on board or else used some other means to take down the plane are still open, and would appear greatly strengthened by the Metrojet analysis. 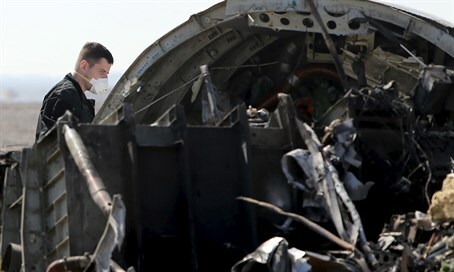 Alexander Neradko, head of Russia’s federal aviation agency, said Sunday that the plane had exploded in mid-air, but did not comment on possible causes of the crash, which officials said had been checked and was in good condition before setting off. The Metrojet plane, bound for St. Petersburg in Russia, crashed 23 minutes after it took off from Egypt’s Red Sea resort of Sharm el-Sheikh on Saturday morning. The 224 people on board, all Russian except for four Ukrainians and one Belarusian, died.